My sister drove in today from Nashville and my folks are already here. My brother and his wife come in on the 24th. They decided to stay in a hotel on the beach since we will be crowded at the house, which is a huge help. I brought Sis up to the station while I checked on things, as I do frequently after hours. It was about 8pm and things were quiet. She drove through some bad storms coming down here and it was sprinkling while we were out by the tower, the moisture in the air giving great definition to the light coming through the Fresnel lens. It was spectacular watching the rotating beams against the low, dark clouds. 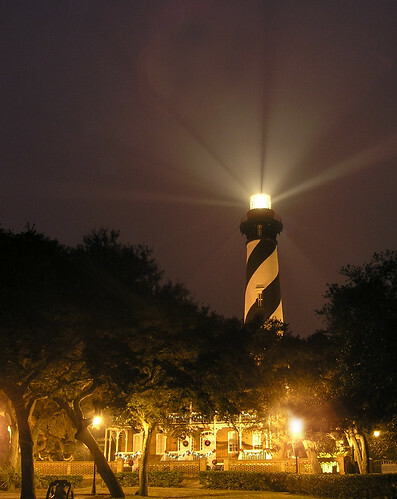 While I would have liked to have better weather for their visit, they will get to see the prettiest Christmas light ever lit in St. Augustine. Oh, sweet memories! You were definitely worth fighting the storms for. Atlanta. . . well that's another story! Gorgeous picture with the blurb. I had such fun with you that night rain and all!